German theologian; historian; born in Obersitzko, province of Posen, Prussia, May 2, 1833; received his first education under his father, who was teacher in Obersitzko. He continued his education under various rabbis, preparing himself at the same time for the University of Leipsic, where he received the degree of doctor of philosophy. 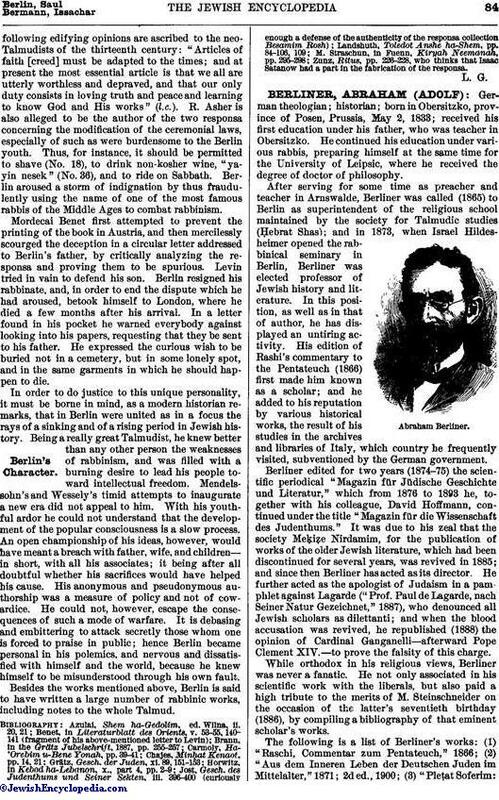 After serving for some time as preacher and teacher in Arnswalde, Berliner was called (1865) to Berlin as superintendent of the religious school maintained by the society for Talmudic studies (Ḥebrat Shas); and in 1873, when Israel Hildesheimer opened the rabbinical seminary in Berlin, Berliner was elected professor of Jewish history and literature. In this position, as well as in that of author, he has displayed an untiring activity. His edition of Rashi's commentary to the Pentateuch (1866) first made him known as a scholar; and he added to his reputation by various historical works, the result of his studies in the archives and libraries of Italy, which country he frequently visited, subventioned by the German government. 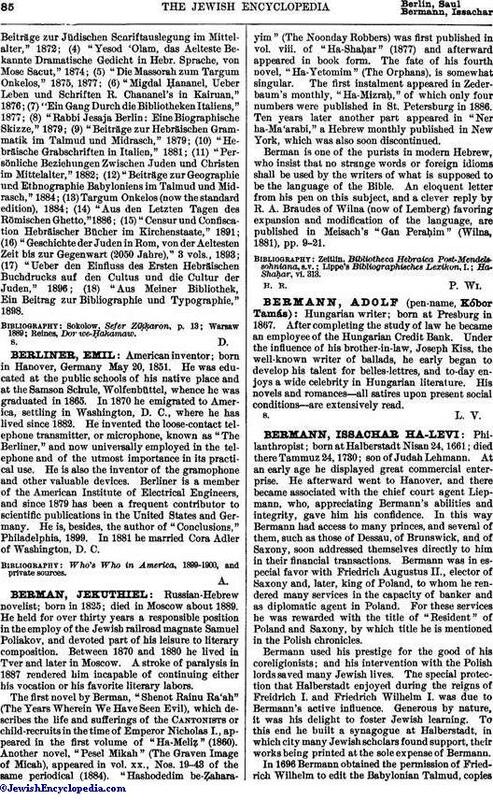 Berliner edited for two years (1874-75) the scientific periodical "Magazin für Jüdische Geschichte und Literatur," which from 1876 to 1893 he, together with his colleague, David Hoffmann, continued under the title "Magazin für die Wissenschaft des Judenthums." It was due to his zeal that the society Meḳiẓe Nirdamim, for the publication of works of the older Jewish literature, which had been discontinued for several years, was revived in 1885; and since then Berliner has acted as its director. He further acted as the apologist of Judaism in a pamphlet against Lagarde ("Prof. Paul de Lagarde, nach Seiner Natur Gezeichnet," 1887), who denounced all Jewish scholars as dilettanti; and when the blood accusation was revived, he republished (1888) the opinion of Cardinal Ganganelli—afterward Pope Clement XIV.—to prove the falsity of this charge. While orthodox in his religious views, Berliner was never a fanatic. He not only associated in his scientific work with the liberals, but also paid a high tribute to the merits of M. Steinschneider on the occasion of the latter's seventieth birthday (1886), by compiling a bibliography of that eminent scholar's works. The following is a list of Berliner's works: (1) "Raschi, Commentar zum Pentateuch," 1866; (2) "Aus dem Inneren Leben der Deutschen Juden im Mittelalter," 1871; 2d ed., 1900; (3) "Pleṭat Soferim:Beiträge zur Jüdischen Schriftauslegung im Mittelalter," 1872; (4) "Yesod 'Olam, das Aelteste Bekannte Dramatische Gedicht in Hebr. Sprache, von Mose Sacut," 1874; (5) "Die Massorah zum Targum Onkelos," 1875, 1877; (6) "Migdal Ḥananel, Ueber Leben und Schriften R. Chananel's in Kairuan," 1876; (7) "Ein Gang Durch die Bibliotheken Italiens," 1877; (8) "Rabbi Jesaja Berlin: Eine Biographische Skizze," 1879; (9) "Beiträge zur Hebräischen Grammatik im Talmud und Midrasch," 1879; (10) "Hebräische Grabschriften in Italien," 1881; (11) "Persönliche Beziehungen Zwischen Juden und Christen im Mittelalter," 1882; (12) "Beiträge zur Geographie und Ethnographie Babyloniens im Talmud und Midrasch," 1884; (13) Targum Onkelos (now the standard edition), 1884; (14) "Aus den Letzten Tagen des Römischen Ghetto," 1886; (15) "Censur und Confiscation Hebräischer Bücher im Kirchenstaate," 1891; (16) "Geschichte der Juden in Rom, von der Aeltesten Zeit bis zur Gegenwart (2050 Jahre)," 3 vols., 1893; (17) "Ueber den Einfluss des Ersten Hebräischen Buchdrucks auf den Cultus und die Cultur der Juden," 1896; (18) "Aus Meiner Bibliothek, Ein Beitrag zur Bibliographie und Typographie," 1898.